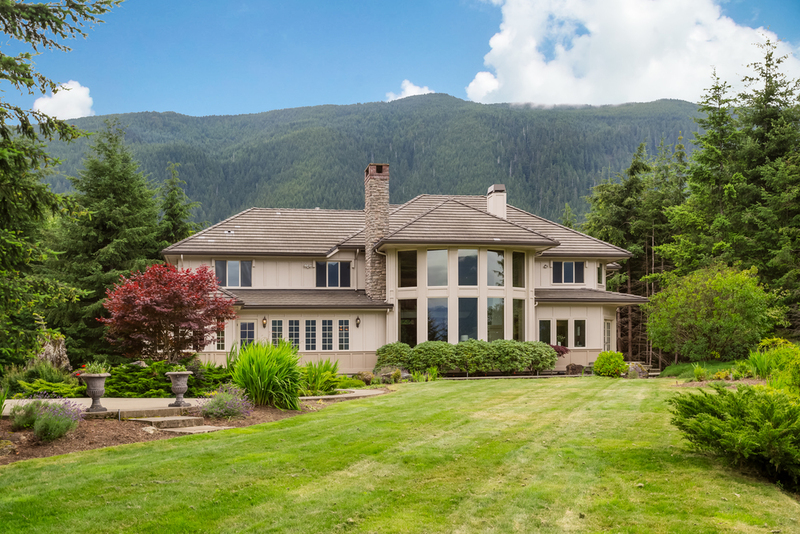 Classical European elegance and luxury meet traditional Northwest style and magnificent natural beauty in this exceptional estate in the Uplands community of North Bend. 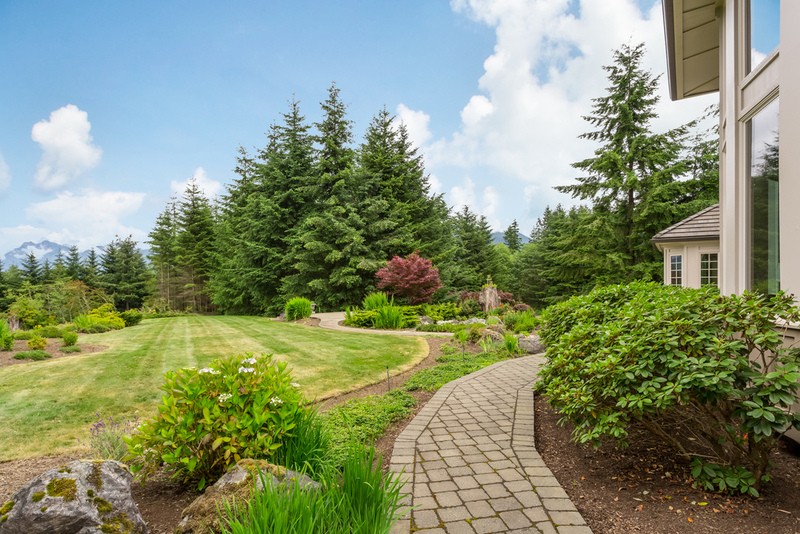 With 4.8 acres of manicured native plantings and outlooks over Mt. Si and surrounding forests, this is a singular residence for those seeking space, solitude and inviting charm. The main level is a grand public living space that is ideal for large-scale entertaining and festive gatherings with its two-story great room and massive cast stone fireplace acting as hub of the home. 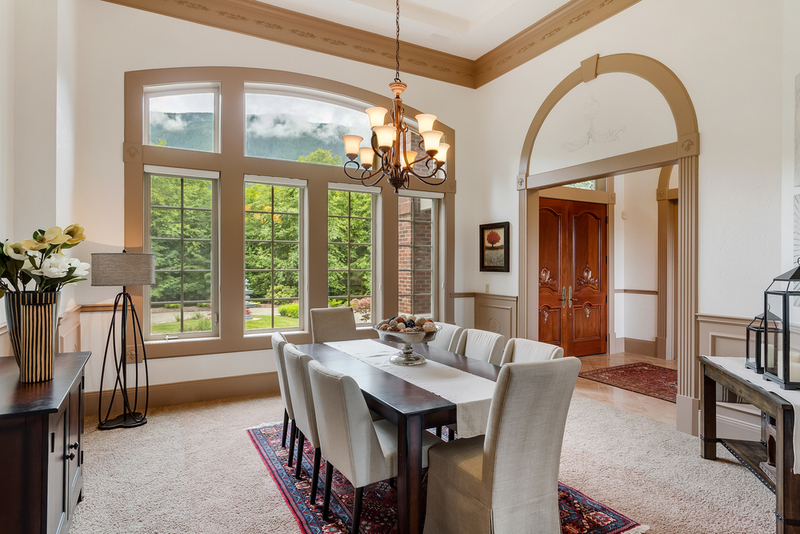 A large formal dining room and home office are accessed directly off the entry, while a large informal family room and gourmet kitchen lie just behind, through a brick archway. A main floor master suite occupies its own wing of the house, while a spacious laundry area and powder room round out the first floor amenities. Directly off the entry is a lavish PRIVATE OFFICE that is accessed via a pair of French doors and which is overlooked by a lofted upstairs sitting room supported by a pair of stone columns. This uniquely voluminous space features custom built-ins and rose marble floors that extend from the foyer, as well as extensive paneling with hand-carved rosette detailing and recessed ambient lighting. Across the foyer from the office is a handsome FORMAL DINING ROOM that overlooks the entry fountain through a large Palladian window. This elegantly appointed area includes paneled wainscoting with a wheat sheaf motif, as well as extra tall tray ceilings with recessed lights and multi-piece crown moldings with hand-carved detail. A pair of grand passageways provides access to the entry and central hallway for easy serving and flow. 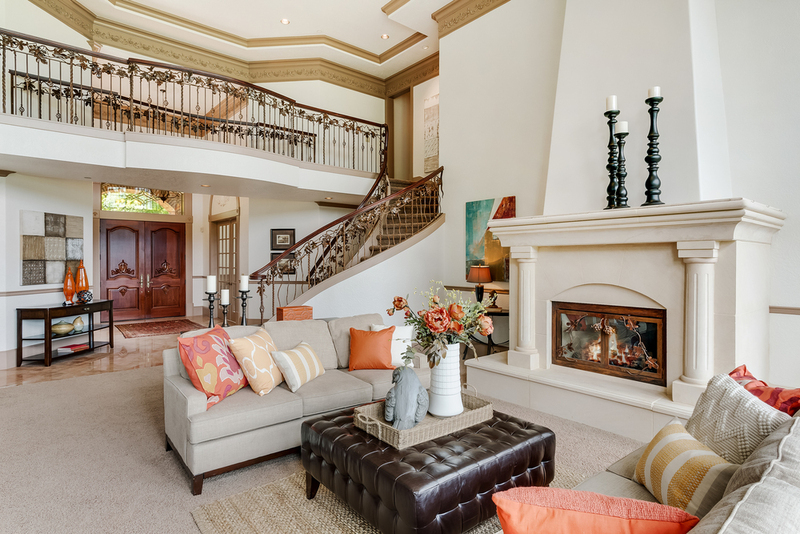 The foyer leads directly into the centerpiece of the house – its opulently scaled CENTRAL GREAT ROOM. 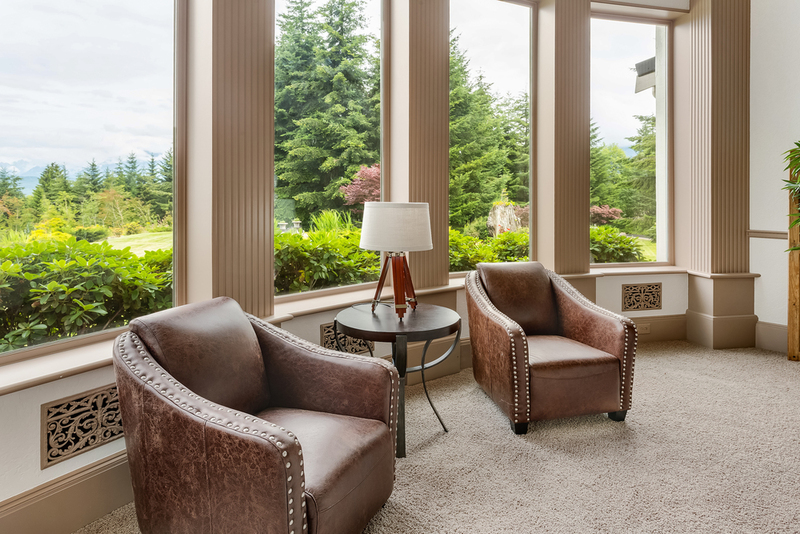 Arranged around a massive cast stone fireplace and oriented to capture breathtaking views of Mt. Si through a two-story wall of windows, this grand formal living area is reminiscent of those found in the great manor houses of Europe, further enhanced by intricate architectural details that include fluted columns, a double tray ceiling with recessed ambient lighting and hand-carved frieze work above French doors with arched moldings. This is both a sublimely comfortable and peaceful room in which to enjoy a fire while watching nature and an opulent and impressive gathering place for large events. The sense of tranquility that its views and volume affords is simply awe-inspiring. A pair of French doors leads from the great room into the more intimate FAMILY ROOM and KITCHEN. Lower ceilings help define this space as the cozy hearth of the home, and it is anchored by a detailed cast stone fireplace in the corner. This area includes a home office area, the gourmet kitchen, a casual dining area and a large seating area around the fireplace. It opens to the level and beautifully landscaped backyard patio. 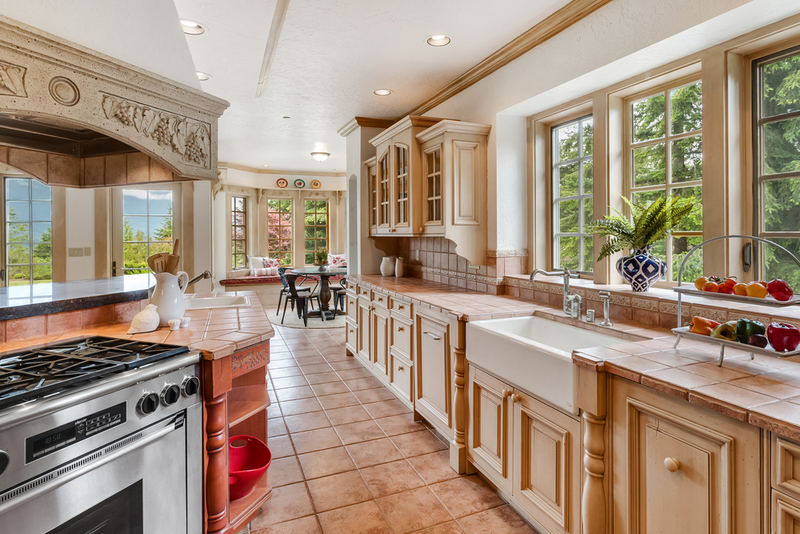 The kitchen is a beautifully constructed creation with custom-built cabinetry with a multi-step distressed finish, hand-made tile counters and floors with a slab granite dining bar, a stone architectural hood and farmhouse sink. The appliances include a professional-style 36” Dacor gas range, SubZero refrigeration and a fully integrated Bosch dishwasher. Of particular note is the beautifully glazed woodwork that integrates this entire area and imbues it with a sense of historic grace and elegance. Crown moldings and over-window shelves match the kitchen cabinets and built-ins and suggest the warmth and worn-in patina of a European farmhouse. A central hallway behind the kitchen leads to the spacious POWDER ROOM and fully-outfitted LANUNDRY ROOM. 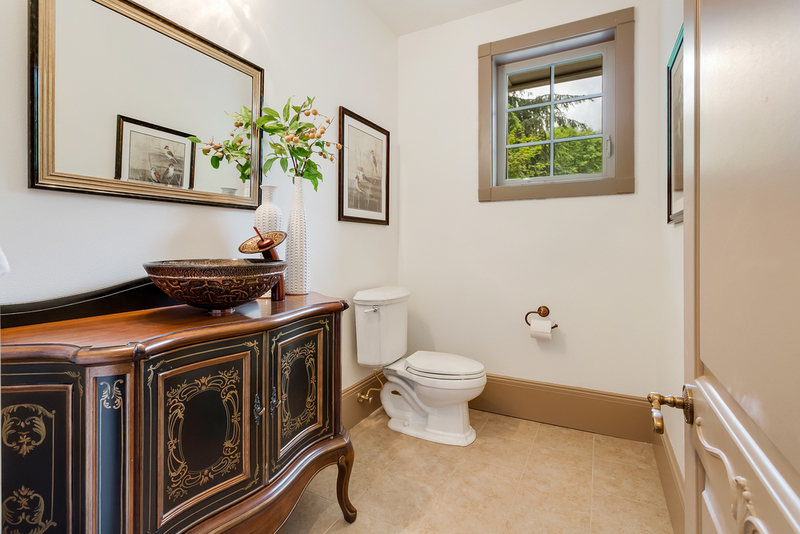 The powder room features an elegant antique-style vanity with an ornate cast glass sink with matching faucet, while the laundry room offers a full compliment of cabinetry, a wash sink and ample hanging room for clothing, as well as a ventilation system to reduce condensation from air drying. The main level is completed by a spacious and spectacularly private MASTER SUITE that occupies its own wing of the house. The bedroom is accessed via a pair of doors off the central hallway and opens out into the back yard via French doors for relaxation on a private patio. A storage hallway with both walk-in and linear closets leads to his and hers master baths. The first bath is a more compact room with a shower, water closet and vanity, while the second is an opulent retreat, awash in marble surfaces and offering a deep cast iron Kohler soaking tub in its own alcove. This is the ideal arrangement for people with differing schedules and routines. A stunning staircase leads from the foyer up to the second level, meticulously detailed with custom wrought iron railings with a grape leaf motif that can be found throughout the house. The upstairs comprises two areas separated by a bridgeway, with a SITTING ROOM, hall bath and large GUEST BEDROOM on one end, and TWO ADDITIONAL BEDROOMS that share a full bath on the other. An additional staircase allows for circular flow between both levels. The second floor sitting room overlooks the office from a mezzanine, and serves as a perfect private reading or media retreat from the rest of the house. All three upstairs bedrooms are generously scaled and offer plenty of closet storage. Both baths are elegantly appointed with custom cabinetry and solid surface counters and shower surrounds. A wide and spacious separate stairway leads down to the GARAGE level, where 4 extra-deep parking spaces are secluded to the side of the house. High ceilings, built-in storage and finished ceilings and walls make this a fantastic space for the vehicle enthusiast who needs plenty of space. A long drive meanders through the forest and past a spacious level lawn to reveal views of the house as it approaches the circular driveway entrance with its multi-tiered central fountain. Gracious terraced stairs lead to an arched brick entry porch that leads through oversized and hand-carved double cherry doors to the grand foyer. This serves as a dramatic primary entry to the house, offering two stories of volume, and centering the floor plan. 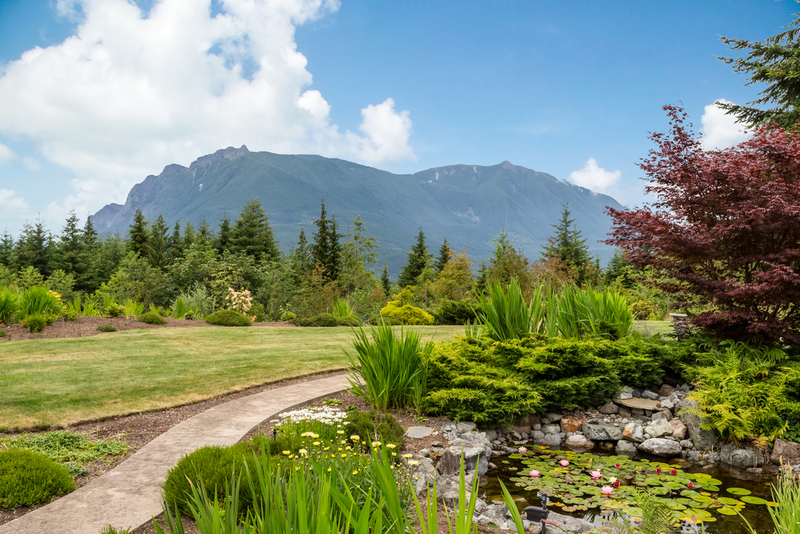 The backyard is surrounded by native Rhododendron species and offers a beautifully naturalistic koi pond with a waterfall. The plantings merge gracefully with the surrounding forest to create an expansive and unbounded effect. Overall, this estate conveys a sense of history and grandeur that is tempered by a warm color palette and charming details that bring its scale into comfortable proportion. 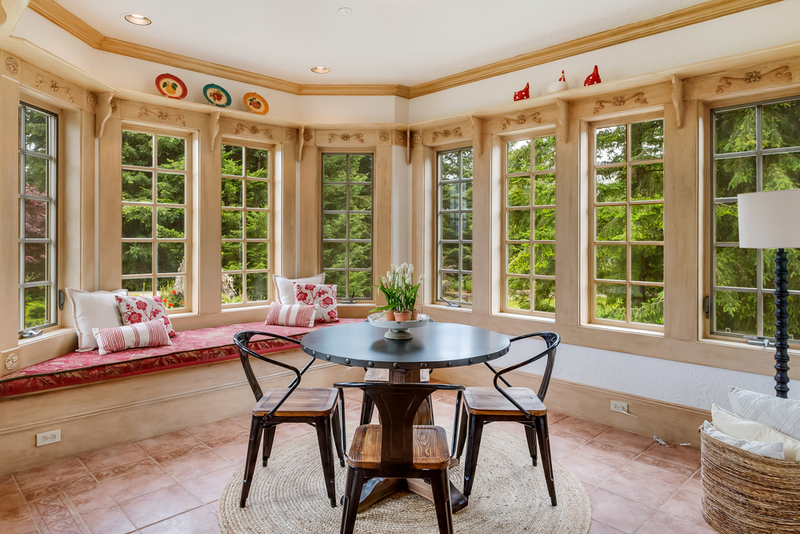 While fine carvings and custom wrought iron define a richly ornate aesthetic, there is a lack of fussiness to the residence that makes it equally viable as a formal entertaining venue for the busy executive or as a playful retreat for an active family. Thoughtful siting that takes maximum advantage of its top-of-the-hill location focuses attention on the natural splendor of Mt. Si and the forests beyond, and wild animal sightings are a regular occurrence on the property.